Jammu, January 07 (Scoop News)-National Conference Vice President and former Chief Minister Mr Omar Abdullah on Monday strongly pleaded for a single party government in Jammu and Kashmir, keeping in view the challenges and magnitude of problems faced to the people, saying experiment of coalitions has not worked well in the state. “In fact, the coalition culture has failed in various parts of the country as well and in a state like Jammu and Kashmir, a stable and strong dispensation was of paramount importance to steer it out of the mess created during the past nearly four years”, Mr Omar Abdullah said at a function at Sher-e-Kashmir Bhavan here this evening. The function was held to greet Peoples’ Democratic Party General Secretary and former IAS officer Mr Mehboob Iqbal and Dr Shahid Mougal, President Bhaderwah Municipal Council, along with their large number of associates into National Conference. Mr Omar Abdullah said the people, dejected by PDP-BJP’s misrule during over three years, are yearning for early elections to send out a terse message to the Centre about its misadventure by thrusting an insensitive and anti-poor government upon the state. He referred to the massive support and goodwill towards National Conference in the three regions of Jammu, Kashmir and Ladakh and exuded confidence that the party will give a stable and responsive government for fulfilling peoples’ urges and aspirations. Referring to prominent political leaders joining National Conference, Mr Omar decried the statement of PDP President Ms Mehbooba Mufti, describing her party’s quitting leaders as garbage and said this speaks volumes about lowest depths of political discourse. He said large scale desertions in the PDP are reflective of the anger among people for the miseries caused to them during the past three and half years. He also referred to Ms Mufti’s observations about the BJP and its central leaders and said when in power she used to walk extra miles in praising Prime Minister Mr Narendra Modi, claiming that he was offering all assistance to the state even without asking. “Now Ms Mufti is seeing everything bad in the BJP, in whose company her government inflicted scars and bruises to the public psyche, which are hard to be filled”, the former Chief Minister said and reiterated commitment of the National Conference in serving the people single-mindely if given the mandate. He said Ms Mehbooba’s ‘toffee and milk tag to youngsters of the Valley’ is still haunting the people. He also took the BJP head-on for neglecting development and alienating the people of the State. He said disillusionment with the BJP is so grave that even its MP from Leh and several corporators in the LAHDC have deserted it. Mr Omar Abdullah welcomed Mr Mehboob Iqbal and Dr Shahid Mougal, saying this will further reinvigorate National Conference in the Chenab Valley region and contribute towards formation of a pro-people government in the state. He said his party has a track record of public service and development in the three regions. In Jammu, the National Conference led governments have a laid a strong edifice of infrastructural development, which is still afresh in the public memory, he maintained. Mr Omar congratulated Mr Iqbal and Dr Mougal, on behalf of the entire NC cadre and President Dr Farooq Abdullah. National Conference Vice President exhorted the cadre to gear up in their respective areas for the big democratic exercise and further intensifying public outreach programme, saying people were the only and real source of strength and fountain head of power. He said public service, communal harmony and regional unity is political philosophy of National Conference which is needed to be sustained by weathering all odds. National Conference General Secretary Mr Ali Mohammed Sagar and Provincial President Mr Devender Singh Rana also addressed the workers and leaders. Pledging their full faith in the policies and programmes of National Conference, Mr Mehboob Iqbal and Dr Shahid Mougal said they will work for galvanizing the grass roots workers at different level. Mr Iqbal described his joining into National Conference at home-coming. On the occasion, several senior associates of Mr Iqbal and and Dr Mougal also joined the National Conference. 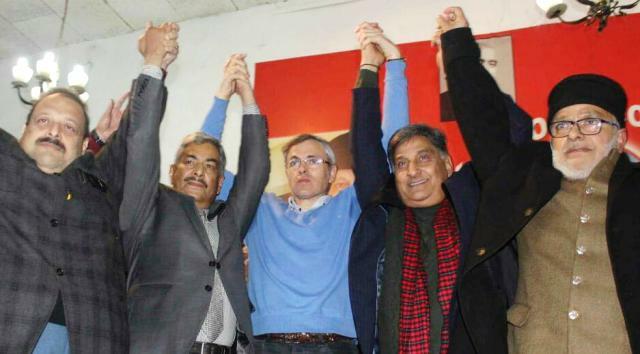 Senior NC leaders also greeted Mr Iqbal and Dr Mougal into the party fold. They included former ministers, legislators and functionaries of various wings of the party.